Background: Sleep and happiness play an important role in the functioning of a person. This study investigated the association between sleep and happiness among nurses and also studied if individual personality traits play a role. Objectives: To measure perceived stress, sleep, happiness and personality trait among nurses & To analyze the relationship between the sleep, happiness and personality trait. Study Design: A cross-sectional study design was chosen for the research. Methods: Thirty nursing staff (females, aged 22–53 years) were selected for the study. The Perceived Stress Scale (PSS) was used for screening stress. Those who scored low (0–13) on the PSS were included in the study. Written informed consent was obtained. Sleep quality, happiness, and personality traits were measured using the Pittsburgh Sleep Quality Index, Oxford Happiness Questionnaire, and Big Five Personality Test, respectively. Scores were analyzed using MedCalc Statistical Software. Results: The mean age of nursing staff with good sleep was 28 years and that with poor sleep was 36 years. It was found that 63% of nursing staff had poor sleep and 37% had good sleep. Among nursing staff with good sleep, 36% were unhappy and 64% were happy. Among nursing staff with poor sleep, 47.7% were unhappy and 52.6% were happy. The mean score for neuroticism was higher in patients with poor sleep (t-test, P = 0.003, 95% confidence interval: -7.96 to -1.76). Conclusions: Nursing staff with good sleep were happier compared to nurses with poor sleep though the difference was not significant. Sleep disturbances increased with age among nurses. The personality trait of neuroticism was higher in patients with poor sleep. Background: Perception regarding efficacy of any intervention may influence clinical reasoning and treatment choice. Despite the fact that the current evidence on the effectiveness of sensory integration (SI) interventions is equivocal, practitioners use them widely in practice. This could be due to the perceived effectiveness. Objectives: This study aimed to gain an understanding of Tamil Nadu (TN) occupational therapy (TNOT) practitioners' perception of the efficacy of SI interventions in pediatric practice. Study Design: The survey research design was used to conduct this study. A ten-item electronic survey was developed based on the research question. Methods: The survey was e-mailed to 295 occupational therapists in TN identified through convenience sampling. 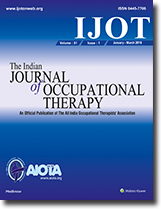 The survey link was also shared on three WhatsApp Messenger groups (TNAIOTA Official Group, OTist Group, and OT Friends Group) with a large number of TN occupational therapists (snowball sampling). Data were collected between March 30, 2018, and April 30, 2018. Results: Forty-nine occupational therapists responded to the survey. Many respondents believed that SI interventions are effective, citing positive therapeutic outcomes and the child-centric nature of the interventions as the reasons behind their beliefs. Respondents also believed that for SI interventions to be effective, therapists' knowledge and skill on SI are critical. Gender, years of experience, additional training on SI, and level of education did not have any influence on practitioners' perceptions regarding the efficacy of SI. Conclusion: Pediatric OT practitioners in TN have a favorable attitude toward SI interventions and use them in practice. Although practitioners report perceived positive therapeutic outcomes, they need validation through clinical research. TNOT practitioners must collaborate with researchers to add to the scientific evidence base of SI. Background: Empirical evidence relating motor-free visual-perception (VP) skills and handwriting (HW) legibility and speed is sparse, despite the theoretical belief that VP is necessary for letter recognition and is an essential component of HW. Therefore, the study was carried out to investigate the effect of VP training on scanning skills, motor-free VP skills, and HW legibility and speed. Objectives: The main objective is to study the effect of VP training on HW legibility and speed; motor-free VP skills and scanning skills. Study Design: This was a single-arm interventional study design was chosen for the research. Methods: Single arm of 10 children of either gender between 6 and 10 years of age, with HW difficulties meeting the inclusion and exclusion criteria, was recruited by convenience sampling. They were assessed pre- and post-training (6th and 12th week) using the letter cancellation test (LCT), Test of VP Skills-3rd Edition (TVPS-3) and Evaluation Tool of Children's Handwriting (ETCH). The intervention included individualized VP training weekly twice along with home program. Results: The mean scores of LCT, TVPS-3, and Evaluation Tool of Children's Handwriting-Manuscript (ETCH-M) of n = 10 were analyzed. Post 12-week intervention, statistically significant improvement were found in mean scores of LCT (P < 0.05, 95% confidence interval [CI] [0.411,0.699]) and on TVPS-3 subtests (P < 0.05, 95% CIs [13.14, 17.46], [11.60, 15.60], [11.46, 14.14], 11.73, 15.87], [11.33, 15.27], [11.66, 15.44] and [11.56, 15.44] sequentially) and on overall mean scores (P < 0.05, 95% CI [12.67, 16.13]). Statistically significant improvements were calculated on ETCH-M subtests- total letter, number, and word legibility scores (P < 0.05, 95% CIs [88.91, 95.69] [100,100] and [79.01, 93.19] respectively); and on near-point copying speed (P < 0.05, 95% CI [35.98, 55.42]) but non-significant improvement was seen on far-point copying speed (FPS) (P = 0.103, 95% CI [23.69, 36.31]). Conclusion: VP training, without HW practice, has an effect in improving scanning skills, motor-free VP skills, and HW legibility and speed (except FPS). Thus, VP training may influence HW legibility and speed. Background: Cerebral palsy (CP) is the leading cause of chronic disability in children making them physically and mentally challenged and socially aloof. CP children also experience a range of comorbidities such as seizures disorder and visual and hearing impairments. Parenting is inherently stressful at times, and studies have shown that being a caregiver of a disabled child is more stressful. Objectives: The objectives of the study were (1) to evaluate the correlation between the level of severity of CP children and its impact on stress on their caregivers, (2) to find the effect of co-morbid factors on the level of stress in caregivers, and (3) to evaluate the relationship between the socioeconomic status (SES) of caregivers and their stress. Study Design: This was correlation study. Methods: One hundred caregivers with the age group between 21 and 62 years participated in the study, of them 13 were male and 83 were female. CP children aged between 1 and 12 years were included in the study. The Gross Motor Function Classification System (GMFCS) for assessing severity level, the Parental Stress Scale (PSS) for parental stress, and the Kuppuswamy Scale for SES were utilized for objective assessment. Results: Weak nonsignificant correlation found between GMFCS and PSS (P = 0.943, 95% of confidence interval [CI] of difference: −2.04–4.01). Strong significant positive correlation between comorbid factors and parental stress (P = 0.000, 95% CI of difference: 4.5–13.2 for visual impairment, P = 0.000, 95% CI of difference: 2.1–15.1 for hearing impairment, and P = 0.000, 95% CI of difference: 4.4–13.3 for seizure disorder); however, a negative nonsignificant correlation was found between parental stress and SES (P = 0.634, 95% CI of difference: 1.4–0.6). Conclusion: The severity of the child's disability had no influence over the degree of parenting stress. Total family income was found to be weakly and inversely correlated with the degree of parenting stress. However, there was a strong relationship between comorbid factors and parental stress. Background: Biofeedback has been employed in substance abuse disorder over the last three decades. Stress, anxiety, and depression are commonly seen in patients with substance abuse disorders. Biofeedback employed in conjunction with other relaxation therapies may be useful in enhancing certain outcome of therapy. Biofeedback either alone for alcoholism or in combination with other relaxation techniques for stimulant and mixed substance abuse and combined with residential treatment program is probably efficacious. Objectives: This study is aimed at assessing effectiveness of biofeedback-assisted relaxation techniques and stress management for substance abuse population. Study Design: A randomized controlled interventional study design was chosen for the research. Methods: The study sample consisted of 60 in-patient males aged 18–55 years, diagnosed with mental and behavioral disorders due to multiple drug use and use of other psychoactive substance, according to the International Classification of Diseases-10, Diagnostic Criteria for Research (1992) criteria (30 in biofeedback and 30 in control groups). The patients were first screened for inclusion criteria and then recruited from CIIMHANS Mental Health Institute of Central India using lottery method for random allocation. A randomized controlled interventional study design was chosen for the research. Sociodemographic data and clinical details of all the patients were assessed using Depression-Anxiety-Stress Scale followed by biofeedback-assisted relaxation techniques, which was conducted for 30 days. Results: The present study shows that there was significant difference in the stress (t = 3.841, P < 0.01, 95% confidence interval [CI]: 3.06–9.73), anxiety (t = 3.849, P < 0.01, 95% CI: 2.06–6.53), and depression (t = 2.03, P < 0.05, 95% CI: 0.03–0.67) among patients of substance abuse disorders in the biofeedback group as compared to control group. Conclusion: The present study found that the biofeedback-assisted relaxation technique is efficacious in decreasing level of depression, anxiety, and stress in patients with substance abuse disorders. The profound deficit in social reciprocity skills is the core underlying feature of the autism spectrum disorder. Inattention and impulsivity of attention deficit hyperactivity disorder children interferes with their ability to accurately identify, imitate, and model appropriate social behaviors. Social skill is any skill that facilitates interaction and communication with others, and evidence suggests that they can be acquired with specific training, opportunities, and practices. Literature suggests that in a developmental approach to social skills training, play is used as the primary medium for intervention, especially with younger children. Three children in the age group of 4–5 years were selected for the study. Socialization domain of the Vineland adaptive behavior scales-second edition was used to get the baseline scores. The children participated in the play-based occupational therapy intervention and each session was carried out for 60 min, twice a week. The children were reassessed after 6 months. The scores' data showed an upward trend and the socialization score of child 1, 2, and 3 improved by 11.6%, 14.8%, and 8.3%, respectively.